There are many threats to the world food supply—and once adulteration is suspected or known, global exports and the supply chain to end users can come to a halt. 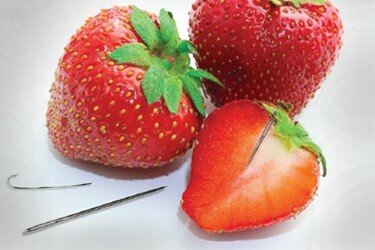 This was evident in the recent tampering of fresh strawberries with needles in several regions of the world. Contaminants can be broadly classified as either physical (foreign material detection) or biological (microbiological, pesticide residue, GMO or nutrition analysis). Growers and processors of fruit and vegetable products must take an active role to ensure that these products are safe to consume—free from both foreign material and biological hazards all the way from the farm to the fork. The alternative is sobering. The price of a food recall or consumer warning goes well beyond the cost of lost product. These incidents can threaten the safety of consumers directly; can cause alarm among a broader range of consumers globally via news and social media; and can furthermore damage a brand’s reputation, in some cases irreparably. This paper will examine foreign object detection in such adulteration events—including discussion of the particular detection challenges in finding very small contaminants such as needles and wire in a complex and fast-moving, global supply chain of perishable products. Ensuring produce is free from foreign objects requires several considerations: a.) the type of foreign object that could be present, b.) how it may enter the process and c). where it may be present in a packaged food product. All three have implications for ensuring that foreign objects are detected and eliminated in the supply chain before reaching the end user.